A new perspective. It is not long since we had the US model of the Asus UX501JW in our hands and we were impressed by the overall concept including the 4K display. Now, the ZenBook is available in Germany with a matte display. Unfortunately, not everything has turned out for the better. 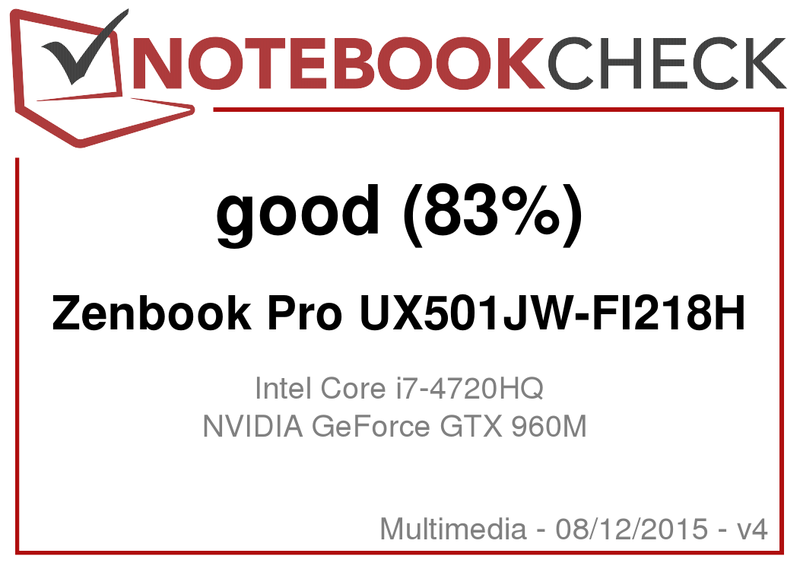 With the recently reviewed Asus ZenBook Pro UX501JW, Asus has presented us with an attractive and powerful notebook for power users. The successor of the ZenBook NX500 convinced us with its excellent system performance, well-made input devices and build quality. Apart from a rather average battery life, it showed flaws such as a display with a yellow tint. This is the focus of our update review. This time we have selected a matte display instead of a glossy 4K one. Please refer to the almost equivalent US test model for further benchmarks and information. We want to summarize the key elements of the German model. An Intel Core i7-4720HQ provides the necessary CPU performance. In addition, it comes with a dedicated Nvidia GeForce GTX 960M. In terms of RAM, the capacity of 16 GB is the same as that of the US model. The situation is different in terms of storage. Instead of a 512 GB SSD, only a 128 GB model is used. However, the test model features an additional 1 TB HDD. Since the HDD requires space, the size and therefore the capacity of the battery has decreased from 96 Wh to about 60 Wh. Currently the bundle retails at about 1600 Euros (~$1777). 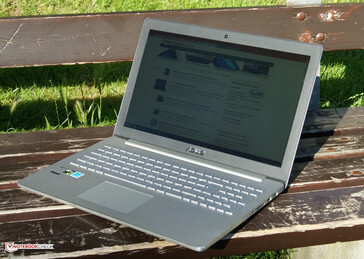 The concept of the ZenBook UX501JW as high-end multimedia notebook is mainly based on its high-resolution 4K display. With a resolution of 3840x2160 pixels, it produces razor-sharp images, which is to be expected in view of a pixel density of 282 dpi. Our current model is equipped with a matte panel, which also allows use of the multimedia device under direct light sources. This was troublesome with our US model, which featured a glossy display. The brightness of the two displays is only slightly different. With an average brightness of 306 cd/m² the current display is just under 25 cd/m² brighter than the previously reviewed model. 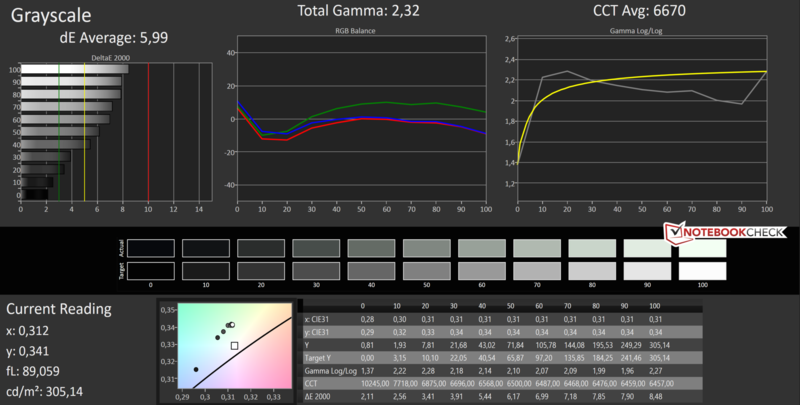 The significantly worse black value of 0.79 cd/m² and the consequent poor contrast of 382:1 are particularly striking. 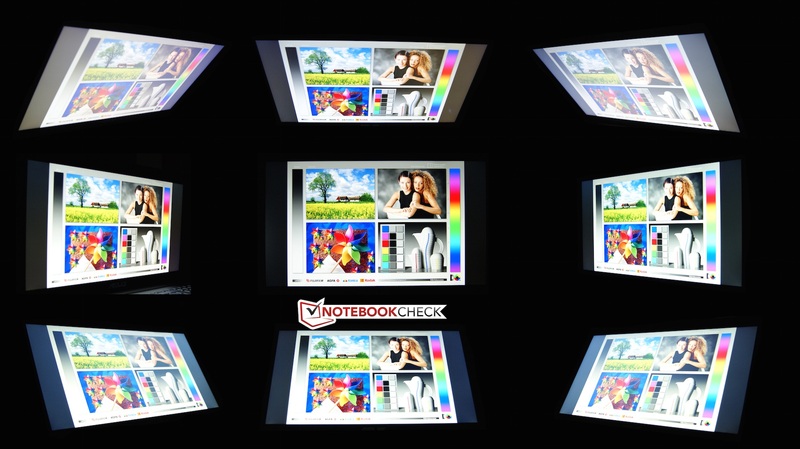 The glossy display variant boasts much better values of 0.29 cd/m² and 949:1. The manufacturer allows selecting from many different display profiles. We chose the default splendid mode, "normal". 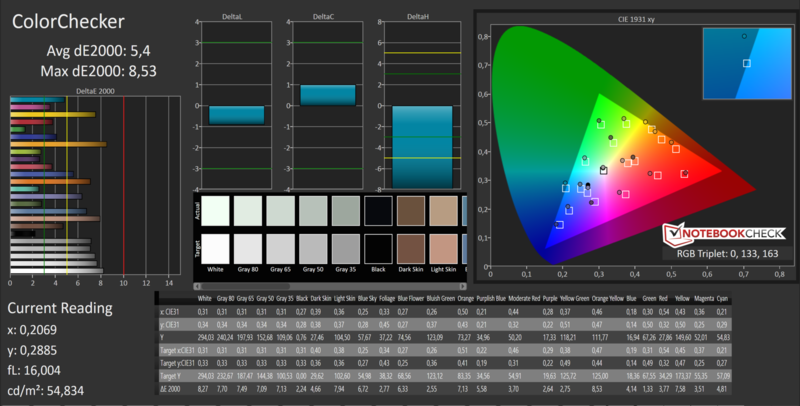 Our previous review model has already not fulfilled the promises on color space coverage. 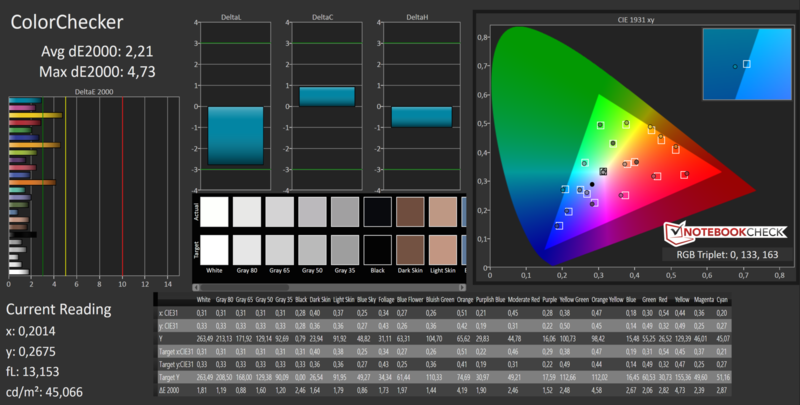 Despite a different display model, our measurements show that the color space coverage of sRGB (71%) and AdobeRGB (45%) are once again lower than Asus' information. As per the manufacturer's site, at least sRGB should be completely covered. 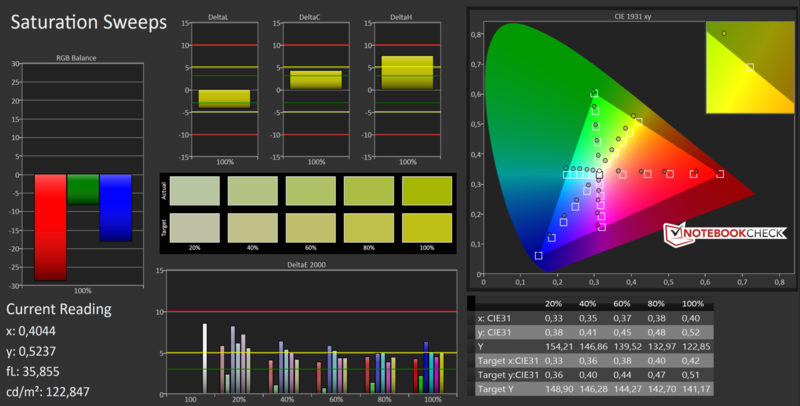 The CalMAN analysis sheds light on the color and grayscale shifts. As with the glossy display, it does not deliver stunning values. The average DeltaE shift of the colors is about 5.4. The situation is similar for the grayscale with an average shift of 5.99. After calibration, the values decrease to 2.21 (colors) and 1.46 (grayscale). The yellow tint of the alternative glossy display was particularly disappointing. 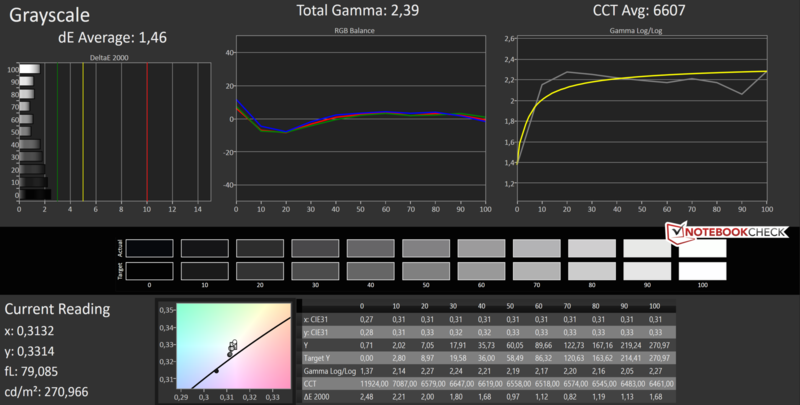 Although it disappeared completely in our test model, the comparison charts now show a slight green tint. However, it is not disturbing in normal use. Let us turn to outdoor usage, which is possible with almost no limitations thanks to the matte display. Those who want to use the multimedia device outdoors can do so as long as direct sunlight does not impair the legibility. Therefore, the available brightness can outshine bright light sources only to some extent. Indoors, the display can be used in almost all imaginable places. 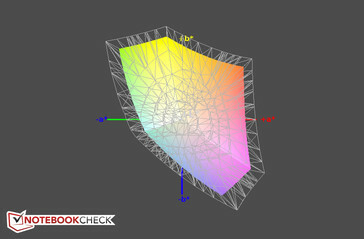 Once a suitable place is found, almost all imaginable viewing angles are possible, since a high-end IPS display is used. Independent journalism is made possible by advertising. We show the least amount of ads whenever possible but we intentionally show more ads when an adblocker is used. Please, switch off ad blockers and support us! ... outdoor usage is possible now. The hardware of the two models only differs in terms of storage devices. However, this is often decisive for the system performance experience. Our test model is always responsive. We wanted to confirm our subjective impression with PCMark 7 results. From our experience, we can say that PCMark 7 in particular profits from fast SSDs. This might be the reason why our Asus UX501JW performs about 7% worse than the US model with a larger and faster storage device. Overall, the result is still positive. This test model is equipped with two different types of storage devices. A 128 GB SSD from SanDisk is used as a system drive. The M.2 device achieves sequential read rates of above 470 MB/s and write rates of about 347 MB/s, while the 512 GB SSD of the previously reviewed UX501 US model accomplished up to 1400 MB/s thanks to a fast PCIe x4 connection. Another difference: Our test model features an additional 2.5-inch hard drive. The 1 TB hard drive should provide sufficient space for data and rotates at 5400 rpm. No other storage options are currently listed on the manufacturer's site. As such, the combination of an SSD as system drive with a large hard drive is a cost-effective solution; however, 128 GB is not much, even if only used for system programs. As mentioned before, there are now two storage devices in our Asus UX501JW. As a result, there is less space available inside. Thus, the current model features a smaller battery. The capacity has decreased from 96 Wh to 60 Wh, which is, after all, one third less. 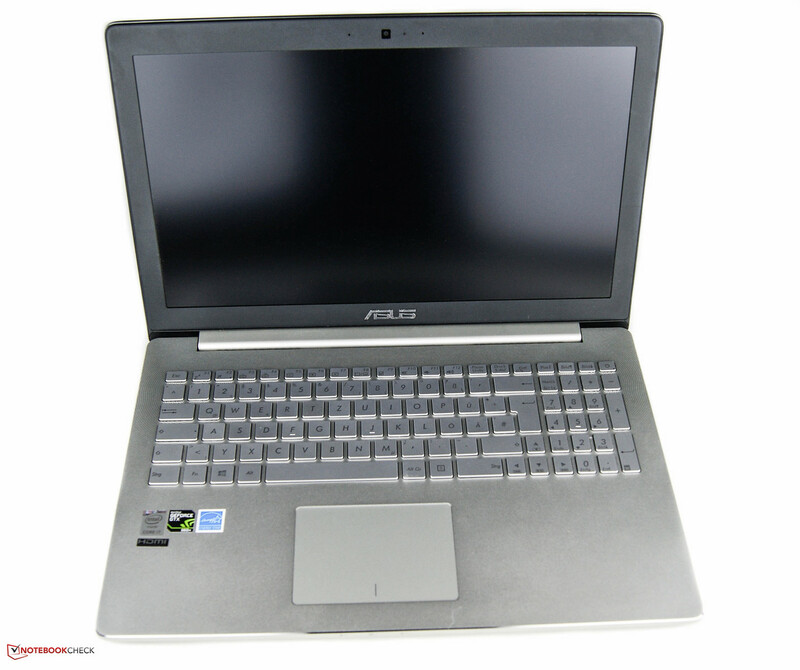 The previously reviewed Asus UX501JW had not achieved praiseworthy battery runtimes. In a realistic scenario, we want to simulate web surfing. With a brightness of about 150 cd/m², the test model shuts down after only 2 hours and 39 minutes. At least, the other model lasted 4 hours and 23 minutes. True mobile multimedia talents like the Apple MacBook Pro Retina 15 last over seven hours. CPU and GPU performance are still convincing. Even though the system performance has decreased slightly, the user experience of the test model is still fast. The main difference compared to the US model is the matte display, which unfortunately does not bring many advantages. Contrast and black value are significantly worse. However, the disturbing yellow tint has disappeared and the matte display can be used outdoors without any problems. In addition, the current model is differently equipped in terms of storage devices. Although the overall storage capacity has increased, the capacity of the fast storage device has decreased. In addition, it lacks the fast PCIe connection. Thus, read and write rates are significantly lower. As a result, the system performance is also slightly worse. The large battery had to make way for the additional, old storage device and the small battery takes its toll. 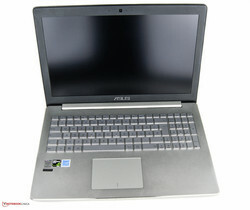 As the Asus achieved just about 2.5 hours in our WLAN test, it is predictable that the device has to be frequently charged or better, remains connected to the grid. With the ZenBook Pro, Asus still offers a device with a high standard. As already reported in the US review, it is not sufficient for the top of the multimedia class. The German model performs even worse. 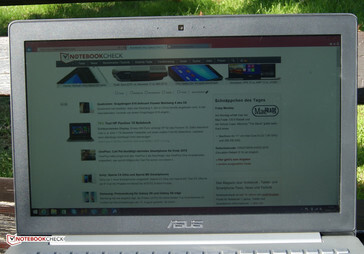 In our opinion, it is very disappointing that only this reduced model of the ZenBook Pro UX501 has made it to Germany. While the matte display is an improvement over the glossy display of the US model, a battery life of not even three hours in realistic scenarios is an imposition in view of a price of about 1700 Euros (~$1889).